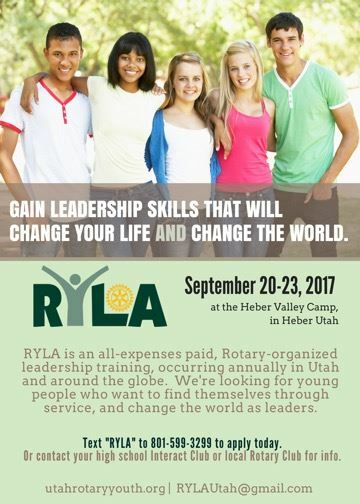 Spread the word about RYLA to high school administrators, Interact clubs, and any high school freshman, sophomores and juniors. Click here for a promotional flyer. Select which student/s your club would like to sponsor for RYLA. Selected students register for RYLA with their parents, by going to the URL listed in their RYLA Award Letter-- which is the ONLY way to get to the registration page. Students will e-mail their documents to RYLAUtah@gmail.com. Please ensure that RYLA students arrive at Aspen Grove (<-- click link for map) between 5:30-7:00pm on Wednesday, September 26. Students can be picked up at 1:30pm on Saturday, September 29. Click HERE for more transportation details.